After the Temppeliaukion Kirkko, we rode the bus en route to the Sibelius Monument. This is one of the coolest monuments I've ever seen. You can sit and stare at this structure the whole day and let your mind surmise its meaning or its significance. 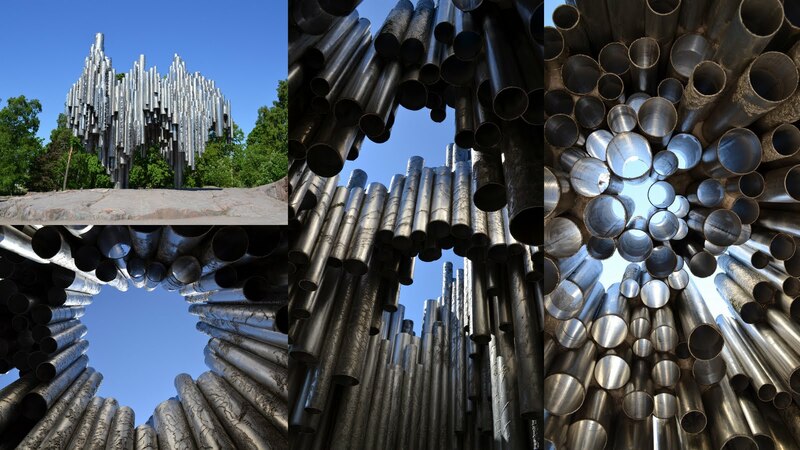 A monument to honor national composer, Jean Sibelius (1865-1957), the monument at first glance reminds me of a pipe organ. Maybe I was compelled to think so since Sibelious is a composer of music. This monument was a result of two competitions added with a heated public debate. In the end, it was Eila Hiltunen who won the competition and was commissioned to build this monument. Sibelius Monument was unveiled on September 7, 1967. Apparently, this wasn't part of Hiltunen's design. The Monument Committee requested a "figurative element" to be added - Sibelius' face during his creative age. This face was drawn by architect Juhani Kivikoski. After visiting the Sibelius Park, we walked towards the back and found this peaceful lake. Helsinki's weather in June is mild and pleasant. Given more time, I would have gladly spent my day having a picnic here. And if you're paying attention, I've got new sneakers :). As many of you have noticed, kayni's corner cafe is becoming my travel journal. I've decided to make it a full time travel blog and if ever you're still interested to read some of my personal ramblings, they'd be posted at kassidy's notes. Thank you so much for always reading and commenting. helsinki is very mysterious to me. i don't see enough pictures of it to form an impression. this trip of yours is helping me form an impression of this capital city. Wonderful shots! Very nice place to visit! Love the monument which looks like a pipe organ too! They made a great and unique monument. i just got your paper airplane letter today! what a surprise! and i have seen that stationery somewhere before. :) thanks for taking time to send me a note! that monument is indeed monumental! they look like giant flutes! did you see moomin valley in finland?